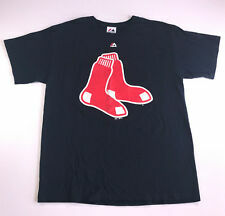 Color : Navy Blue with Boston Red Sox Graphic. Shirt Length: 27". Size : Large. Colors bright and vibrant! Underarm to Underarm: 20.5". 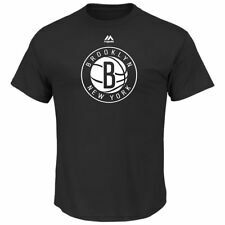 This shirt is a must for any Nets Fan. GO NETS ! Short sleeve. Front, from collar to bottom hem: 26. CERTAIN it will fit. We will make every attempt to make things right monetarily or otherwise, when possible. THINGS TO KNOW ABOUT Mar-TEE’S and Such . Armpit to armpit: 23. Front, from collar to bottom hem: 26. CERTAIN it will fit . We will make every attempt to make things right monetarily or otherwise, when possible. DEFECTS: None. . Length - Down the Center of the Back 30". Width - Armpit to Armpit 23". Pre-owned Excellent Condition. Chest (arm pit to arm pit): 21". Length (Back of collar to bottom of shirt): 28.5". Top of Collar to bottom of piece along front 28". Pit to Pit with lying flat down 20". Color: Blue, with Oilers logo on front. -Length (from top of rear collar to waist hem) 28". Size: Large. -Chest (armpit to armpit) 20". We want you to be happy! New York Yankees Logo T-shirt. Top to Bottom: 29". Armpit to Armpit: 20". 100% Cotton. T-Shirt Specs. New York Yankees Baseball Logo T-shirt. Blue color. It is a size L, Large. The overall condition of this shirt is excellent, nearly new and hardly worn. Collar to bottom - 26". Pit to Pit - 21". Material:100% Cotton. Chest (pit to pit):21.5". Neckline to Hemline: 28.75". New York Yankees Baseball T Shirt Size L Majestic Tee Measurements Laying Flat: PLEASE TAKE YOUR FAVORITE SIMILAR SHIRT AND DO SAME MEASUREMENTS BEFORE BIDDING IF UNSURE. THANK YOU. Armpit to Armpit - 22 in. Top of collar to Bottom of Shirt - 30 in. Once received if there are any issues please CONTACT ME FIRST THROUGH MESSAGES so we can work to resolve any problems. Thank you for checking out my listings! Super cool retro graphic on soft cotton blend tee. The shirt is grey with a slight bluish hue to it - really nice looking color. Majestic Chicago Cubs Raise the Flag National League Champions T-Shirt. 100% Cotton. Width at chest: 22". Screen Print Atlanta Braves Tomahawk Logo on Front & WIN IT FOR BOBBY. Style: Graphic Tee Short Sleeve. Condition: Great Condition. (Beefy soft cotton. 30" from top to bottom. 4) Is it new/used?. Detroit Tigers History T- Shirt. Very nice pre-owned shirt. Buffalo Bills. Graphic Team Mascot T-shirt. Size: Large. Smoke Free. This item is in used, pre-owned condition. I respond fairly quickly. Arm pit to arm pit = 23". The t-shirt is navy blue with screen printed text and graphics. T-shirt is an adult size Large (L) and made of 100% cotton. Chest - 40" (20" pit to pit). 100% cotton.